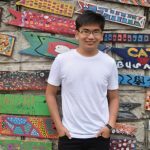 Not sure where to go for a delicious buffet in Singapore? We've got you covered! I, for one, love a good buffet. I mean, why settle on one particular type of food or cuisine when you can sample everything in one go? In fact, a good buffet is one of the things I look forward to the most when I stay at a hotel. Why else would I wake up before 10 a.m. while on holiday? Apparently, I'm not the only one out there who enjoys flavourful buffet spreads (what a surprise, am I right?). Frankly, I am shaken by this discovery. But not enough to stop me from sharing with you this ultimate list of 10 hotels in Singapore with sumptuous buffets to feast your heart out! Let's get straight to it! If you're looking for a buffet spread with flavours which are close to home, look no further than Holiday Inn® Singapore Orchard City Centre's in-house buffet restaurant, Window on the Park. The restaurant boasts two different recurring themes throughout the week. From Mondays to Thursdays, it serves up delectable Southeast Asian cuisine, from local Singaporean delights to dishes from Malaysia, Thailand, Indonesia and Vietnam. But during the weekends, Window on The Park takes their buffet spread a notch higher. 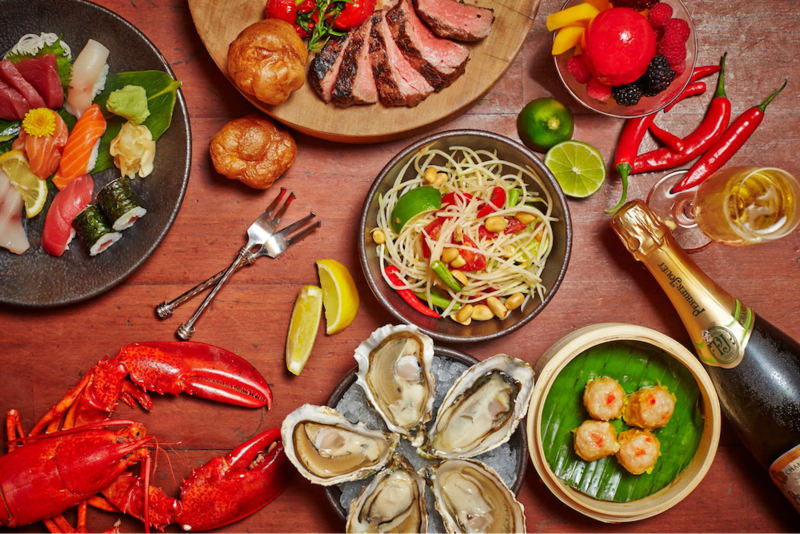 Featuring succulent Boston lobsters along with a myriad of indulgences from the ocean including baby lobster, fresh juicy prawns and scallops, their Boston Lobster Weekend buffet is not to be missed, especially If you love fresh, delicious seafood! And while you’re at it, why not bring the entire family there for a much-needed staycation? Kids get to stay and eat for FREE! As a family-friendly hotel, Holiday Inn® Singapore Orchard City Centre even has a gift for each of its child guests: an exclusive welcome pack! It’s prime location also means tons of dining and entertainment options right at your doorstep. Sounds like the perfect weekend getaway plan? Available at Kwee Zeen every Friday, Saturday and Sunday from 6pm – 9.30pm, head to Sofitel Singapore Sentosa & Spa for Singapore Buffet Nights! Feast on local favourites and delicacies, such as Chicken Rice, Popiah, Singapore Laksa, and Char Kway Teow at the live stations. Prices start from $68++ per adult, and $34++ per child. And if you’d like somewhere to rest and nurse your food coma after that sumptuous meal, why not have a staycation right there? Treat yourself and your loved ones to a luxurious Bali-esque escape surrounded by lush greenery, and explore Sentosa for the weekend! 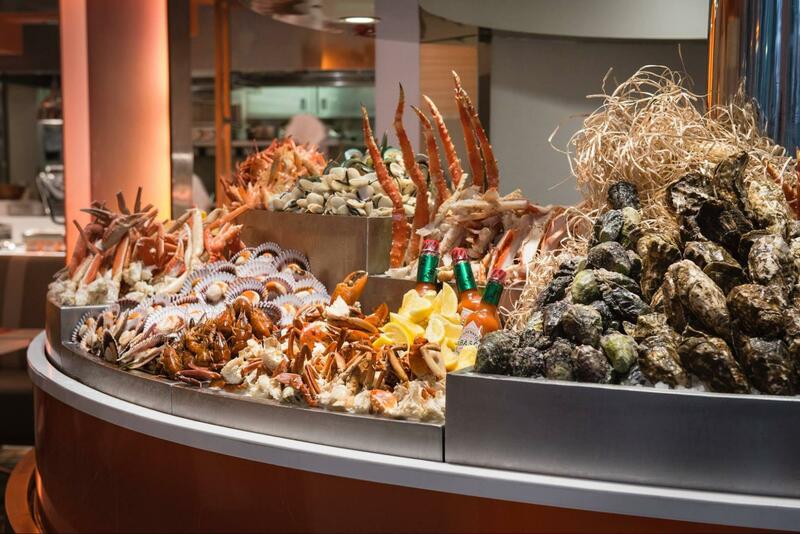 Pan Pacific Singapore's Edge is an award-winning premium buffet restaurant boasting over a hundred different dishes to choose from! 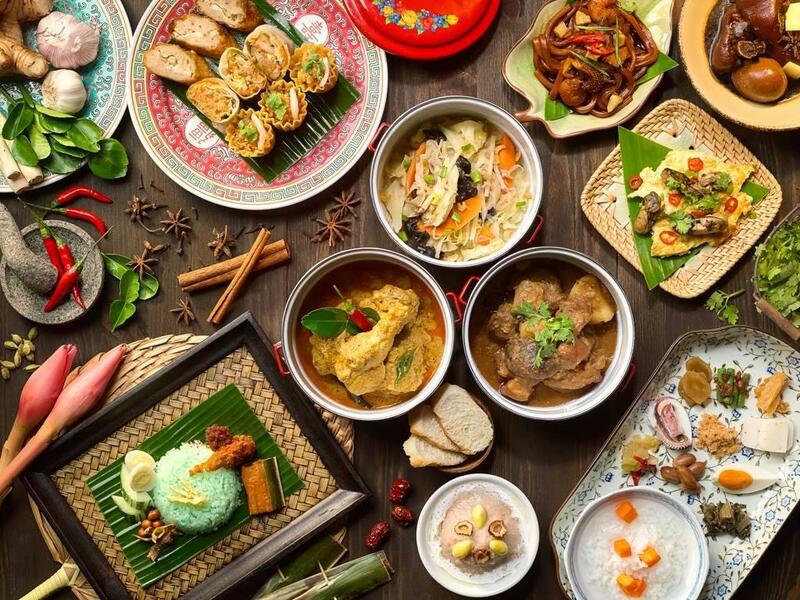 Featuring seven live food stations offering a variety of Asian cuisine, Edge's main draw is its Saturday heritage lunch buffet which treats diners to an authentic taste of Peranakan cuisine. 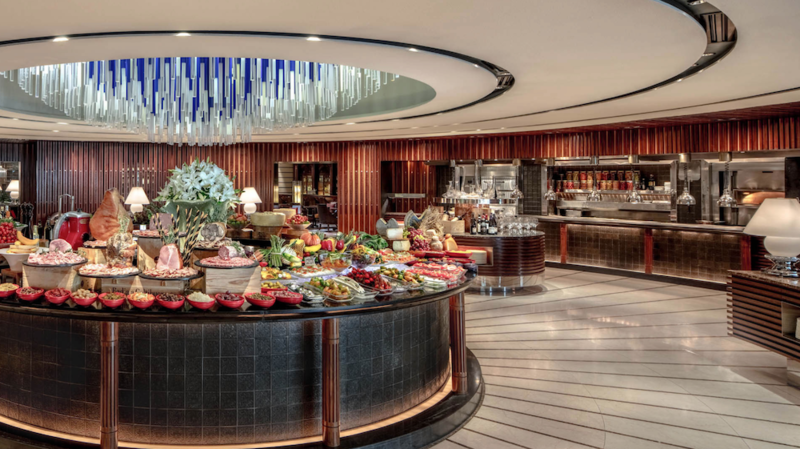 Adding a premium touch to their buffet, Edge's buffet even features close to 30 different artisanal kinds of cheese and a live a la minute foie gras station! What's more, the dishes on offer at Edge often change based on seasonal and festive themes, ensuring that the culinary experience stays fresh and exciting all the time. Highly regarded as one of the best hotel buffets in Singapore, Melt Café (located on the 4th floor of the Mandarin Oriental) thrills and excites palettes with its scrumptious multi-cultural buffet spread, highlighting both local and international flavours including fresh sashimi. Employing the increasingly popular open-kitchen concept, be dazzled as skilled chefs prepare the very dishes you crave in front of your eyes! What truly sets Melt Café apart though, is its Northern Indian cuisine section which offers a tantalizing variety of aromatic curries! To further spice things up, the buffet also features a Live Gourmet Station which combines premium ingredients and familiar flavours to bring guests an experience unlike any other. Psst, I hear that the Boston Lobster Laksa is to die for! For a fiesta of rustic international flavours, you can't go wrong with Oscar's Café & Terrace! 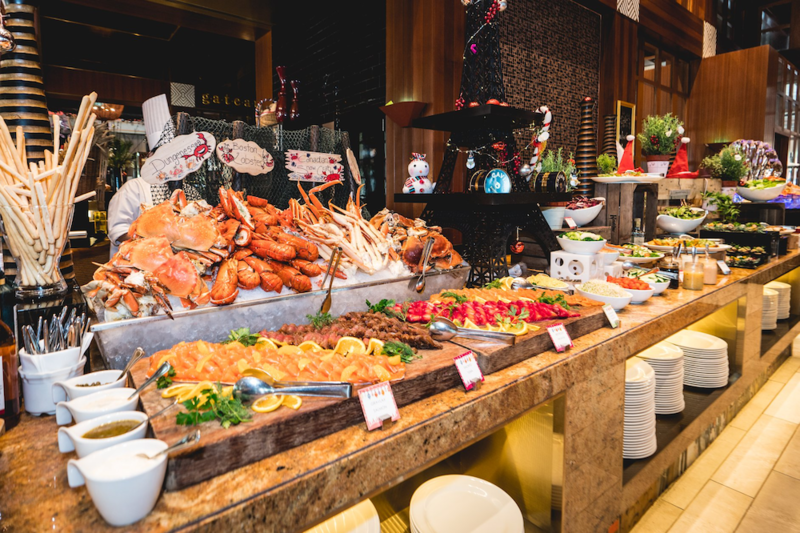 Conrad Centennial Singapore's popular buffet restaurant offers an awesome Sunday brunch buffet menu, featuring treats such as Boston lobsters, fresh sashimi, foie gras, London duck and much more! With 8 stations showcasing different culinary styles, diners will be spoilt for choice as they decide which dish they'd want to sample first! Will it be the oven-roasted prime rib from the carving station? Alaskan King Crab legs from the seafood station? Or a simple hot bowl of noodle soup from the made-to-order Asian noodle station? 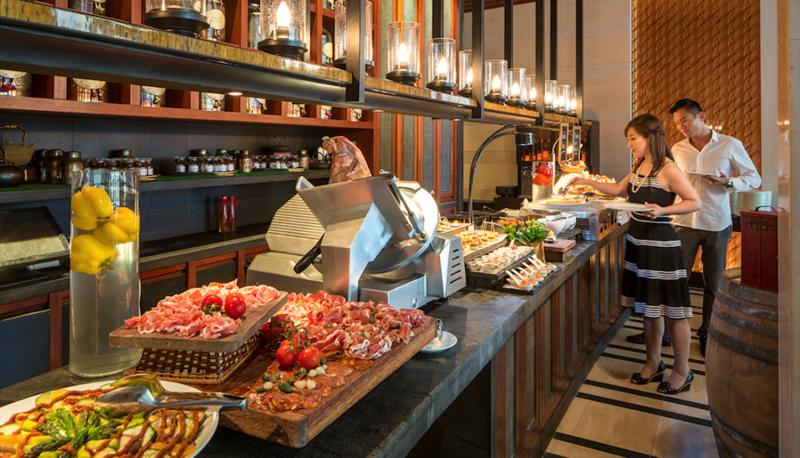 With so many different dishes to choose from, Sunday brunch at Oscar's is truly an unforgettable affair. 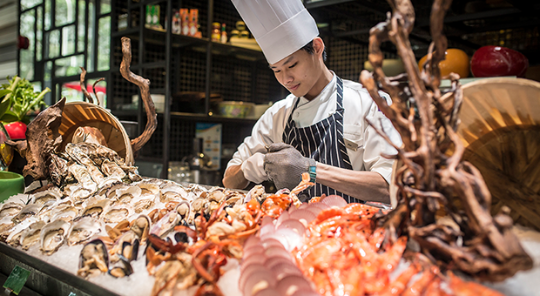 The Shangri-La brand has always been recognised as a hallmark of excellence and Shangri-La Singapore's buffet restaurant, The Line, keeps to the standard. A finalist for Best Buffet Restaurant in the Chope Diners’ Choice Awards 2017, The Line brings a theatrical element to its mouth-watering buffet spread. Bread in The Line is freshly baked in full view of guests as a means to guarantee the freshness and taste of the pastries, as well as to provide some entertainment to the guests watching! 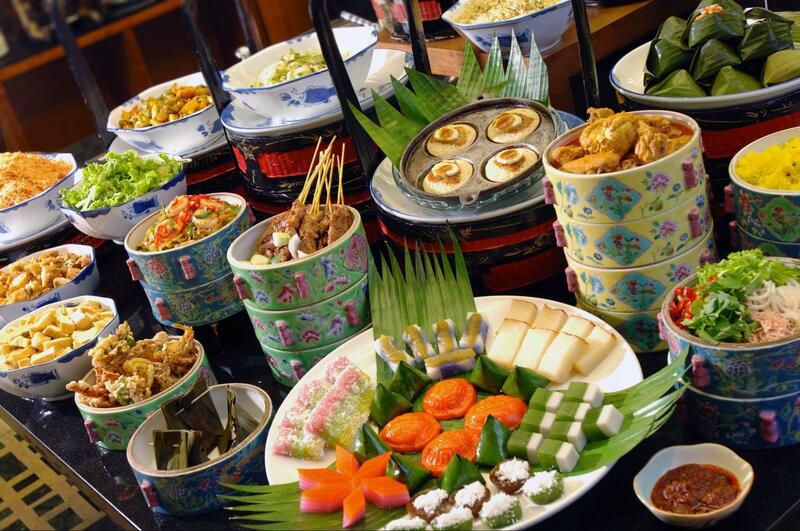 And much like the other buffet spreads in this list, buffets at The Line feature a great variety of both familiar Singaporean cuisine as well as international dishes from no less than 16 culinary styles! 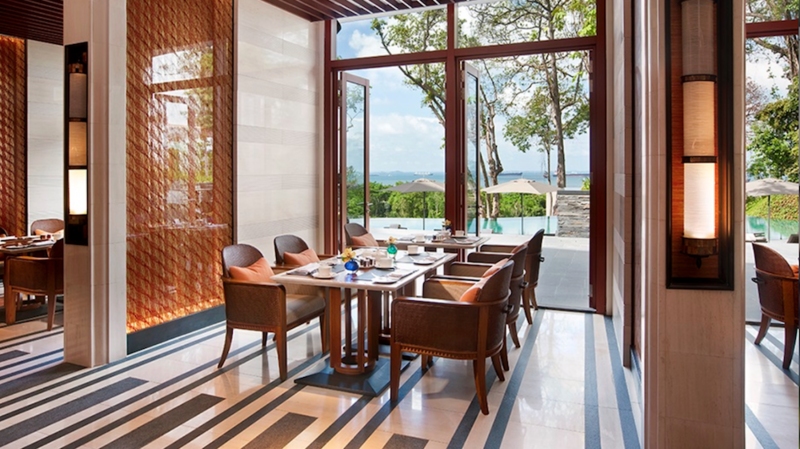 And with the restaurant strategically located to offer alluring views of the hotel's lush gardens and swimming pool, guests can rest assured that a buffet at The Line will be a pleasant experience for both the palette and the eyes. A buffet is more than just stuffing one's face with delicious food. It's the atmosphere and the dining experience that complement the buffet which truly makes a lasting impression. And at The Knolls , the ambience truly takes centre stage. Located at Capella Hotel in Sentosa, The Knolls is likely one of the most serene lunchtime spots in Singapore, offering an authentic Mediterranean dining experience with a spectacular seafront view. The resort-like ambiance is augmented by the restaurant’s al-fresco seating and live band, but take nothing away from the food on offer! In addition to the usual dishes, you can also find an outdoor BBQ station, Spanish cold cuts and hams, and even a variety of seasonal oysters in the cold seafood section to whet your appetite! I have to be honest: as much as I love buffets, the repetitive 'flavours-of-the-world' concept can get really old really fast. Which is why I'm grateful for niche buffet spread concepts like the one in Copthorne King Hotel's Princess Terrace Café which features mainly authentic Penang cuisine! And this is not just because I'm a Penang boy at heart, okay? 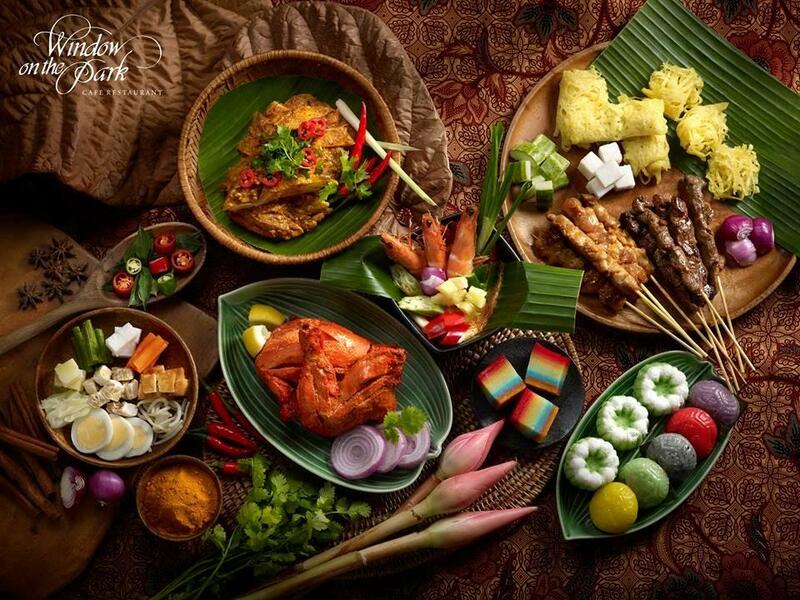 Utilising traditional cooking methods at their live stations, the buffet at Princess Terrace Café perfectly recreates the timeless tastes and aromas of traditional Penang favourites such as char kway teow, Penang laksa, prawn noodles, popiah and the well-loved traditional kuehs. What's more, children will enjoy the do-it-yourself ice kacang station where they can make their own shaved ice dessert! 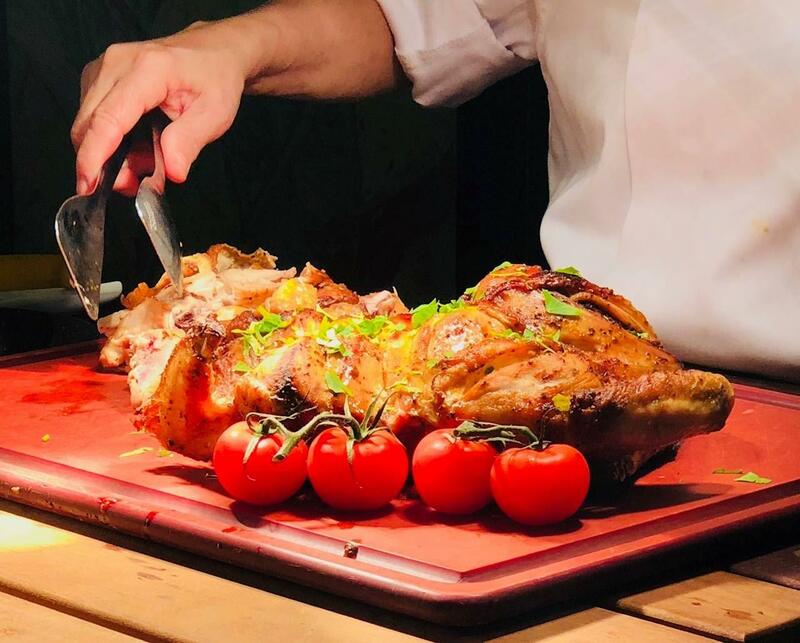 While Basilico does not offer as extensive a buffet spread as some of the other entries on this list, Regent Singapore's in-house buffet restaurant makes up for its lack of quantity with quality. Specialising in authentic Italian cuisine, Basilico has earned a reputation as a top-notch restaurant in the industry. Offering a fine selection of fresh, seasonal Italian dishes complemented by fresh seafood and a plethora of aromatic herbs and spices, buffets at Basilico truly showcase the best of Italian cuisine. The wine cellar, espresso bar and rotisserie all help turn up the ambience at Basilico and leaves customers with a lasting impression. I'm usually not much of a dessert person but when I'm at a buffet, I make it a point to end my meals with something sweet. And while most buffet spreads feature a chocolate fountain, Lime, the buffet restaurant of PARKROYAL on Pickering , does it a little different by offering a green, Matcha-flavoured chocolate fountain instead! But apart from the unique centerpiece of its dessert corner, Lime's buffet spread also features an impressive selection of contemporary Asian and Western flavours, with its 3 open kitchens (including its popular Peranakan kitchen) ensuring that guests get to enjoy the full spectrum of an interactive dining experience. What's more, seafood lovers surely would not want to miss Lime's annual Lobsterfest where, you guessed it, guests are treated to an all-you-can-eat lobster extravaganza! Grand Hyatt Singapore's Mezza9 is known to offer one of the most innovative hotel buffets in Singapore! A trendsetter, Mezza9's whole concept is based on the desire to offer guests 9 different dining experiences in one restaurant. This includes the usual western grill, seafood bar, sushi and sashimi, European deli in addition to unique stations such as the yummy yakitori grill and Middle Eastern cuisine! The open kitchen concept of Mezza9 keeps guests entertained as they dig into the delicious dishes they can select from. One must try dish is the liquid nitrogen lime meringue, which is exactly as visually impressive as it sounds! To add to the atmospheric buffet, Mezza9 occasionally arranges for live performances during meal times, ensuring that guests leave with a memorable experience. Feast to your heart's content! 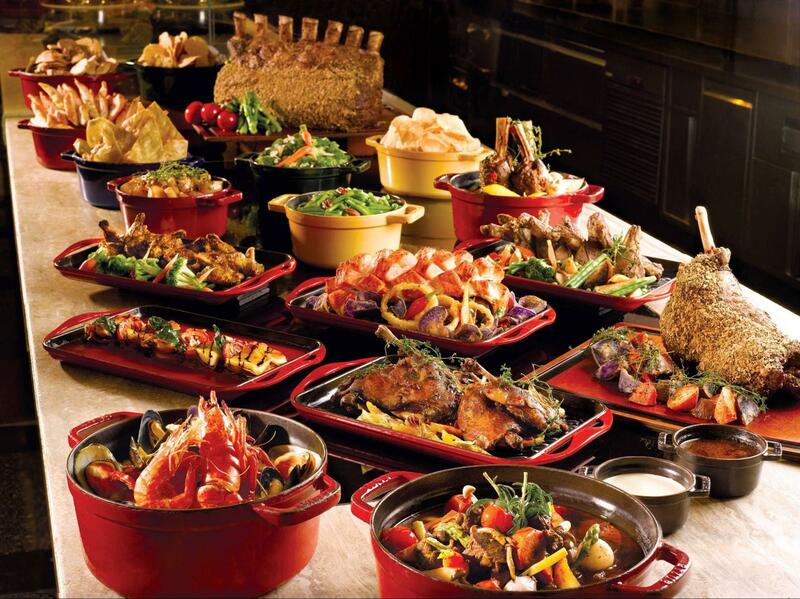 And there you have it, 11 hotels in Singapore with the most sumptuous buffet spreads that will leave you coming back for more! So, whether you're on a holiday and just want to feast like a king, or simply want a good place for a champagne brunch on Sunday, all I can say is, bon appétit! For more hotel deals and staycation options, head over to TripZillaSTAYS and take your pick!